Manchester boasts an amalgamation of architecture, both old and new, appealing to lovers of almost every style of architecture, if you know where to look. The first structure that you see as you drive into the city may be the imposing Beetham Tower, but it is by no means the most impressive. Read on to discover five of the most striking buildings in the city centre, all of which you can admire from the exterior or head inside to see more. If you only have the chance to visit one building in Manchester, make a beeline straight for the Town Hall. Built in 1877 by Alfred Waterhouse, this striking building stands on Albert Square, overlooking many markets, festivals and events throughout the year (including the world-famous Christmas markets, when the ‘Zippy’ Father Christmas sits proudly below the clock tower). A Grade I listed building, it is one of the most impressive examples of neo-Gothic architecture in the entire country, featuring an ornate array of spires and the instantly recognisable clock tower. 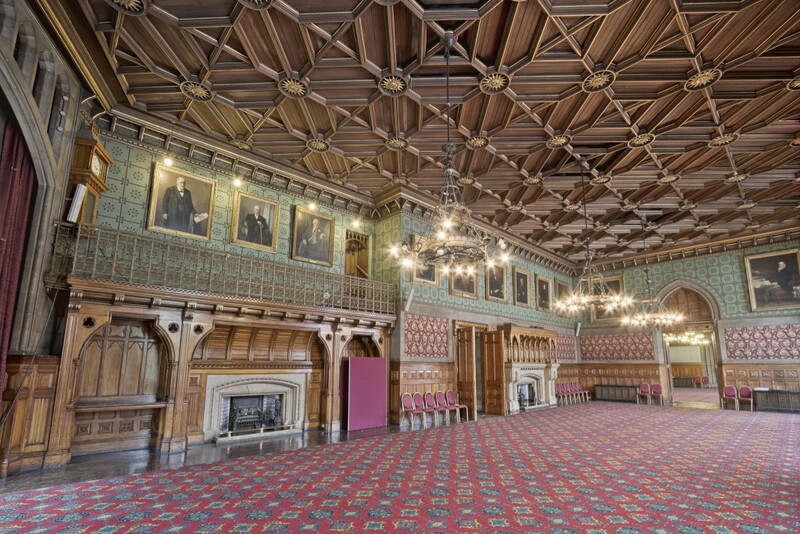 Inside, the series of ceremonial rooms, including the Great Hall, can be used for weddings, events and banquets, or can simply be explored by enthusiasts. Original interior features – including tiles, mosaics, painted ceilings, murals and ornate fireplaces – have all been preserved, providing suitably grand surroundings. Don’t miss the decorative tiles on the floor featuring the infamous Manchester bee. Another grand old building that a lucky few can get wed inside, John Rylands is still in use as a functioning library (as part of the University of Manchester library), although many visitors come simply to admire the architecture. The building is actually a vast memorial to the late John Rylands, conceived by his wife and designed by Basil Champneys. Similar in style to the Town Hall, this is another example of neo-Gothic architecture that is revered worldwide. Four predominant materials make up the structure: Cumbrian sandstone, Polish oak, white moulded plasterwork and bronze metalwork, creating a distinctive aesthetic that oozes elegance and opulence. One of the best ways to admire the library (unless you are an academic here to peruse the impressive collection of rare books and manuscripts) is to simply wander through its many halls, rooms and staircases, allowing yourself to get disorientated while admiring the ornate features. 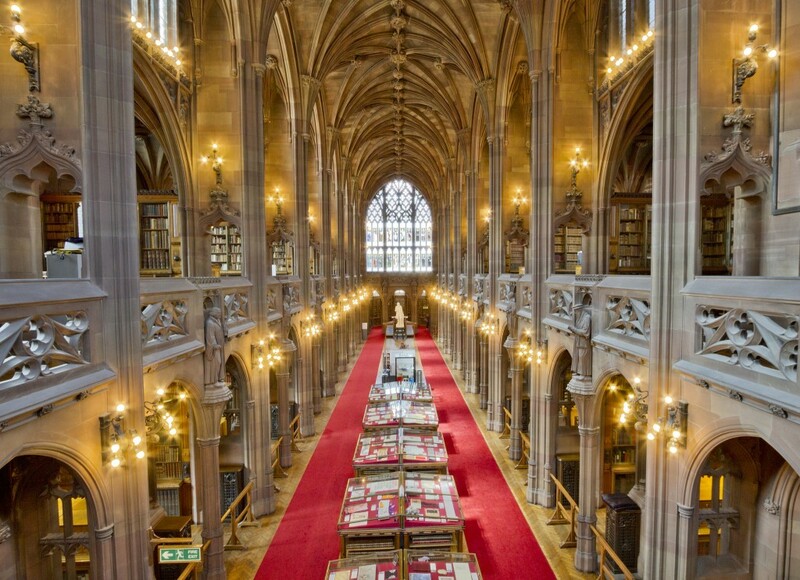 Having recently reopened in 2014 following a £50-million refurbishment, Manchester’s Central Library has resumed its rightfully earned place as one of the city’s most impressive structures and finest event spaces. 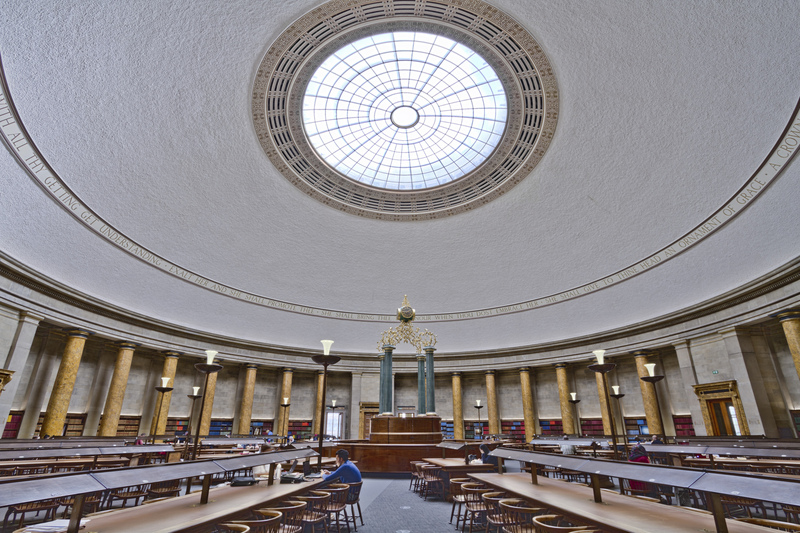 Designed by E. Vincent Harris, the library’s circular design is apparently based on the Pantheon in Rome, creating a bold and impressive building that was unlike anything else in Manchester when it opened in 1934. Not all of the building is accessible to the public, with several archive areas reserved for academics and historians only, but the impressive entrance hall, grand staircase and beautiful reading rooms are well worth a visit, even if you have no interest in the books and collections housed inside. Keep your eyes peeled for a diverse collection of events occurring inside the library, ranging from eclectic musical performances to children’s theatre and book readings. Manchester’s leading concert venue is also its most impressive modern structure, opened in 1996 to critical acclaim. Its unusual design is constructed predominantly from concrete, designed specifically to create the optimum acoustics inside. The building actually hovers above the ground, connected to its foundations by 300 giant springs that help protect the inside chambers from external vibrations. The vast and impressive auditorium combines two traditional forms of seating – the ‘shoebox’ and the ‘vineyard’ – to bring the audience as close to the stage as possible. 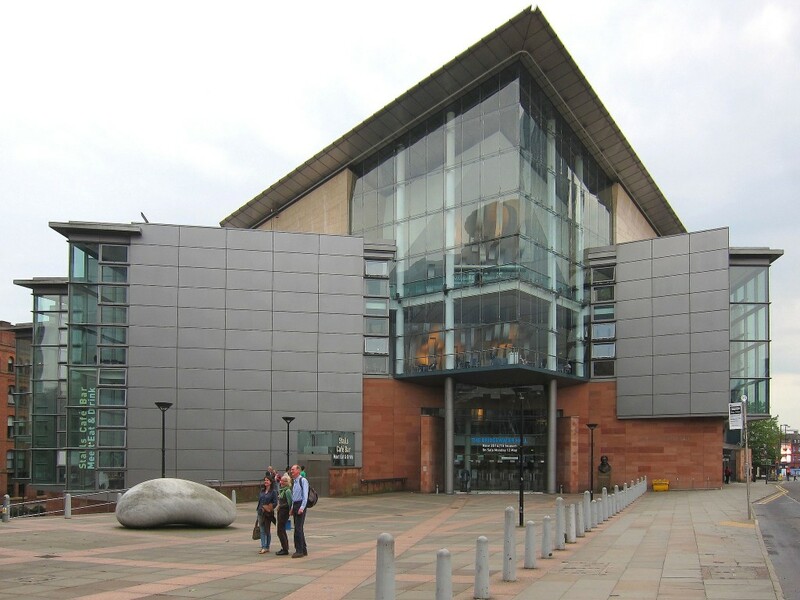 Alongside a programme of musical performances by artists from all genres (although there is a large emphasis on classical music), the building is also used for graduations, weddings and exhibitions. 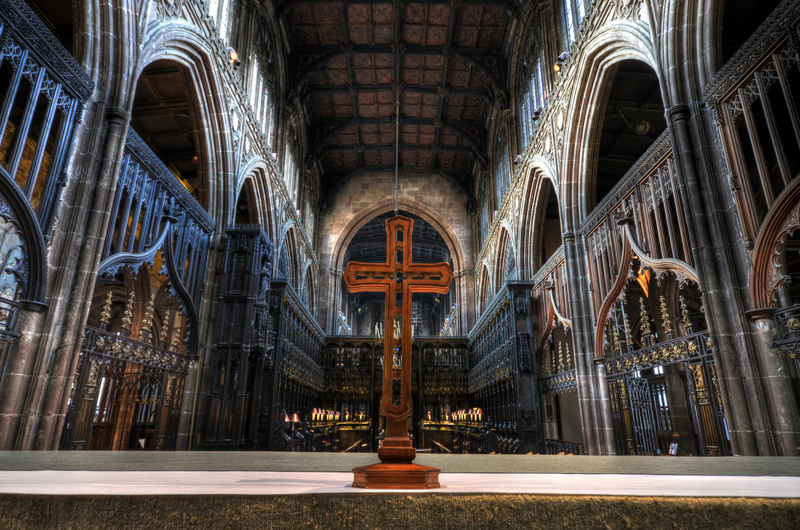 One of the oldest buildings in Manchester, the Cathedral has a vast and extensive history that can be traced back to humble beginnings in the 7th century, becoming a Cathedral in 1847. Having survived significant damage during both World War II and the IRA bomb, the Cathedral has undergone extensive refurbishment several times over the past century, creating a lovingly preserved building that appears much more modern than it actually is. The Cathedral is open to the public, who can admire the architecture and numerous little quirks inside, including the misericord wood carvings and bees on the roof. Numerous events are scheduled throughout the year, including both classical concerts and upbeat musical performances by raucous bands.